The ASEAN Tourism Strategic Plan (ATSP) 2016-2025 states that adventure tourism should be promoted regionally. Prior to that, the ASEAN Tourism Marketing Strategy (ATMS) 2017-2020 stated that ASEAN member states have adopted nature and adventure as one of its four overarching themes. The ATMS 2017-2020 defines adventure travel as travel which involves exploration or travel to remote, exotic and possibly hostile areas. “It gains much of its excitement by allowing its participants to step outside their comfort zone and may include activities such as mountaineering, trekking, bungee jumping, mountain biking, rafting or rock climbing,” stated the report. Though rafting and rock climbing have long been on the bucket list for adrenaline junkies in Southeast Asia, hot air ballooning is steadily gaining in popularity. From floating over the skies of Cambodia’s historic Angkor Wat to taking in views of Malaysia’s vast Kenyir Lake, a growing list of operators are offering thrill seekers a unique bird’s-eye view of familiar sights. A key event for hot air balloon enthusiasts in Malaysia is the Putrajaya International Hot Air Balloon Fiesta. This year the fiesta will run from 28-31 March. Held for the 10th year, AKA Balloon the organiser, expects 20 hot air balloons from countries such as Belgium, India, Malaysia, Spain, Taiwan, Thailand and United Kingdom to woo the crowd at this year’s event. Attracting over 200,000 visitors the last time it was held in 2017, the Putrajaya International Hot Air Balloon Fiesta also provides a platform for businesses to showcase their products and build on brand exposure – with 750 food and beverage vendors, 580 dry goods vendors and over 50 corporate companies having benefited from the event to date. In Myanmar, Balloons over Bagan provides breath-taking flights over the ancient temples of Bagan, while in the Philippines, the four-day Philippine International Hot Air Balloon Fiesta is the country’s biggest hot air balloon festival. Running for 22 years, the Philippine International Hot Air Balloon Fiesta (PIHABF) is billed as the longest-running aviation sports event in Asia and has been “annually boosting tourism in Clark and the whole of Pampanga (province),” said Joy Roa, event director and head of the PIHABF organising committee. 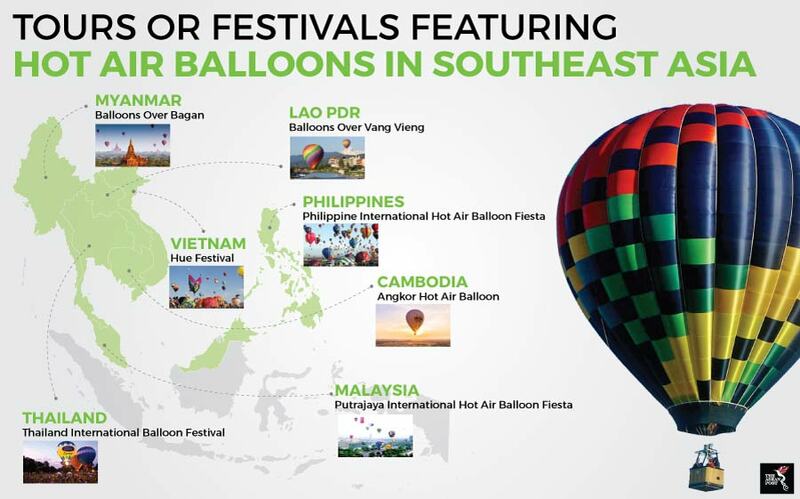 In Thailand, last year’s International Balloon Festival in Chiang Mai – which was organised for the 10th year – featured booths from India, France, Germany, Spain, Sweden and Switzerland. “A hot-air balloon can only be on show an hour at a time, so what’s the next gimmick?” asked organiser Sornchat “Aom” Krainara rhetorically. “You think about modern consumer behaviour – they also come here for the great-tasting food and to have fun with the music. And we appeal as much to expatriates and foreign tourists as we do local people. “I changed not only the venue but also the time, moving it to the first week of March, in tourism’s low season. I wanted to stimulate tourism too,” she added. All over the world, governments and promoters are recognising the value of using hot air balloons as a tool for tourism. In Saudi Arabia, tourists will soon be able to visit the ancient ruins at Mada’in Saleh, the country’s first UNESCO World Heritage site, by taking hot air balloon tours. In Turkey, tourism authorities in Cappadocia – an UNESCO World Heritage site famous for its villages carved out of the hillsides – have seen a 63 percent increase in the number of tourists taking hot air balloon tours in 2018. “It makes a great contribution to the economy and it also provides employment opportunities in the region,” said Mustafa Durmaz, an official from the Cappadocia Tourism Development Cooperation. The world’s largest hot air balloon event, the Albuquerque International Balloon Fiesta, attracted nearly 600 balloons and 1,000 pilots from all over the world for the nine-day festival in Albuquerque, New Mexico which drew close to 900,000 spectators last year. As reported in Forbes, the 2017 edition produced nearly US$173 million in total economic impact, including nearly US$10 million in tax revenues for the city, the county and the state, according to an economic impact survey by marketing research firm Forward Analytics. It is perhaps this economic aspect that hot air balloon events in Southeast Asia can do more to exploit. With more aggressive marketing of niche adventure tourism attractions like hot air balloon festivals, ASEAN could be well on its way to increasing the direct contribution of travel and tourism to its gross domestic product (GDP) which stood at US$135.8 billion (4.9 percent of GDP) in 2017 and is steadily on the rise.